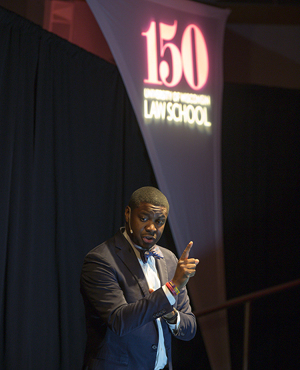 The University of Wisconsin Law School’s graduating class has selected the Honorable Everett Mitchell to present the keynote address at its 2019 Hooding Ceremony. Mitchell serves as a circuit court judge in Dane County, a position he was elected to in April 2016. From 2012 to 2016, he was UW-Madison’s director of community relations, and prior to that he served as an assistant district attorney in Dane County. Mitchell received his juris doctorate from the Law School in 2010. He also holds bachelor’s degrees in religion and mathematics from Morehouse College, and a master of divinity and a master of theology from the Princeton Theological Seminary. Along with Mitchell, the graduating class has selected Professor Miriam Seifter as its faculty speaker. Naman Siad and Gya Williams, J.D. graduates, and Yuzhen Zhang, a graduate law student, were selected as student speakers for the ceremony. The hooding ceremony—a special recognition for students receiving law degrees—will take place at 1 p.m. May 10 at the Monona Terrace Community and Convention Center Exhibition Hall, One John Nolen Drive. At the ceremony, faculty members place the J.D. doctoral hood over the head of the graduate to signify his or her success in completing their law degree. The hooding event is in addition to, and does not replace, the university-wide commencement. The Law School will provide a live stream of the ceremony. Check law.wisc.edu the day of the event for details.